Set along ¾ mile of Oak Creek just minutes from Sedona, Lo Lo Mai Springs has dozens of beautiful shaded RV sites, many near the creek beneath the branches of ancient cottonwoods and soaring sycamores. All sites have water and 30 amp electrical service (a few have 50 amp). Some that are a bit farther from the creek also have sewer hookups and patio slabs. 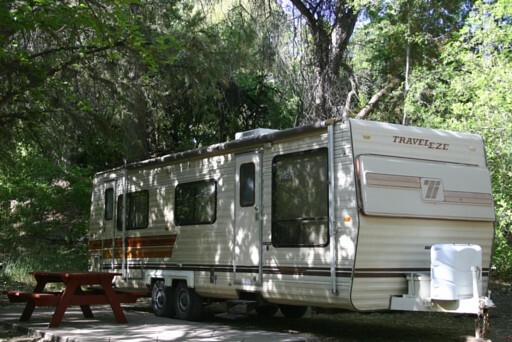 All RV sites have a fire ring and picnic table, and charcoal grills can be borrowed at no cost from the store. Because the property is set down a steep drive in a creek valley populated by hundreds of trees, access is limited to Motorhomes of 40’ or smaller and Travel Trailers/5th Wheels of 36’ and smaller. Reservations are required and can be made by calling (928) 634-4700 from 9:00AM-5:00PM daily.